A static mixer is a device for blending (mixing) two liquid materials. The device consists of mixer elements contained in a cylindrical (tube) or squared housing. 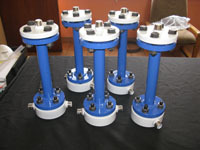 The static mixer elements consist of a series of baffles that are made from metal or a variety of plastics. 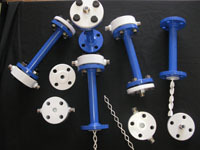 Similarly, the mixer housing can be made from metal or plastic. Typical materials of construction for the static mixer components included Mild Steel, stainless steel, polypropylene, and PTFE (Teflon). The overall system design incorporates a method for delivering two streams of liquids into the static mixer. As the streams move through the mixer, the non-moving elements continuously blend the materials. Complete mixing is dependent on many variables including mixer length, tube inner diameter, the number of elements and their design. 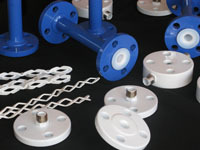 CIP manufactures a range of both threaded and flanged PTFE (Teflon) mixers. 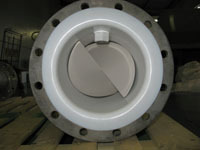 These mixers are available from 1″-6” diameter, and are constructed of PTFE Lined schedule 40 carbon steel. They can also be supplied in PTFE lined Schedule 40 Stainless steel. These mixers have solid stainless steel mixing elements that are coated in a 1mm PTFE coating. Internal elements can be made up of solid PTFE as well. These mixers have elements that are available in two material configurations. The exterior of all Teflon lined mixers comes with an option of PTFE coating, or an epoxy coating using Sigma products to protect against damage from aggressive environments.